The Wacissa River offers paddlers the opportunity to see north Florida unfiltered. Being off the beaten path has many advantages. 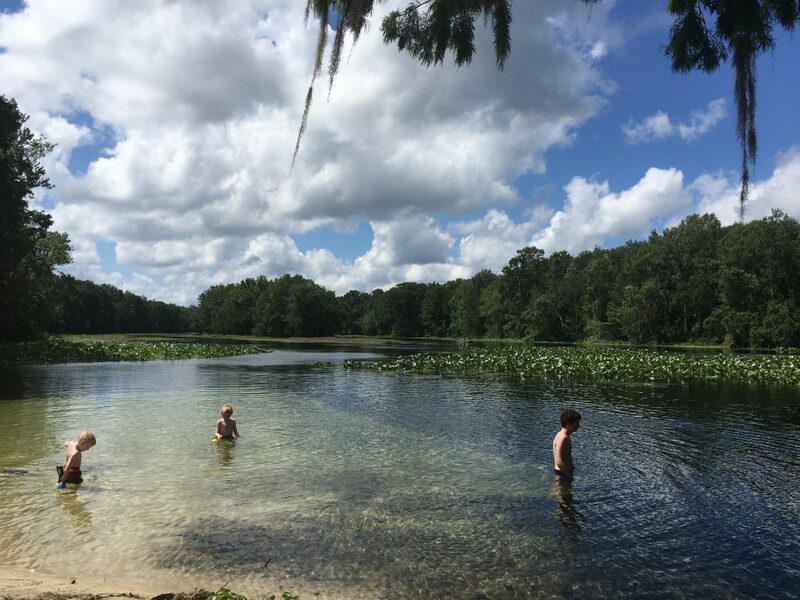 In the case of a spring-fed river, it translates to less pressure from human use and a great opportunity for those who do visit to experience the “real Florida”. The Wacissa River, located in the southern half of Jefferson County, Florida, is near the crossroads identified as the town of Wacissa. There is a blinking light, a post office, and two small convenience stores where beer, ice and snacks can be purchased. Access to the river is about two miles south of the blinking light on Florida 59, just after the state road veers to the southwest. The blacktop spur quickly become a dirt parking lot after passing several canoe and kayak rental businesses. A county maintained boat landing with pick-nic tables, a manmade beach, and a tiny diving platform with a rope swing are the only signs of civilization. The cold, clear water extends to a tree line several hundred yards south of the landing with the river moving to the southeast. The river emerges crystal clear from multiple limestone springs along the first mile and a half of the 12 mile waterway. The adjacent land is flat and subject to being swampy, especially in wet years like 2018. The river terrain stands in contrast to the Cody Scarp just a few miles to the north. This geologic feature is the remnants of an ancient marine terrace and is hilly, rising 100 feet above the river in some spots. Cypress, oak, pine, and other trees cover the bottomlands adjacent to the river. The river quickly enters the Aucilla Wildlife Management Area which results in a wide variety of animals, birds, amphibians and reptiles. The wildlife viewing varies by season. Many migratory birds use the river’s shelter and resources on their annual trips. Canoeing and kayaking are popular in the gentle current. Powerboats and fan boats can use the area also, but must be on constant alert for shallow spots and hidden snags. For the adventurous paddler who wants to follow the river’s course, there is a debarkation point at Goose Pasture Campgrounds and another near St. Marks after the Wacissa merges with the Aucilla. Be prepared when taking this journey. This is the real Florida, no fast food restaurants or convenience stores. Only clear water, big trees and the calls of birds will be found here. Hydrologic cycle and geologic cross-section image courtesy of Florida Geological Survey Bulletin 31, updated 1984. 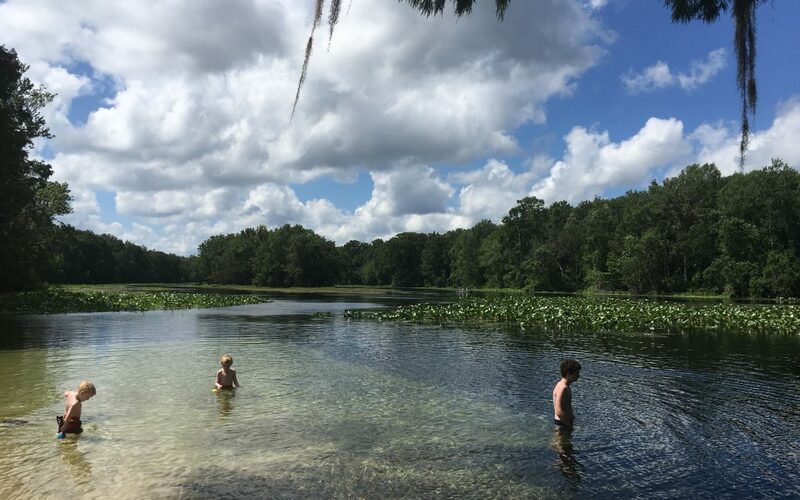 With more than 250 crystal clear springs in Northwest Florida it is just a short road trip to a pristine swimming hole! Springs and their associated flowing water bodies provide important habitat for wildlife and plants. Just as importantly, springs provide people with recreational activities and the opportunity to connect with the natural environment. While paddling your kayak, floating in your tube, or just wading in the cool water, think about the majesty of the springs. They are the visible part of the Florida Aquifer, the below ground source of most Florida’s drinking water. 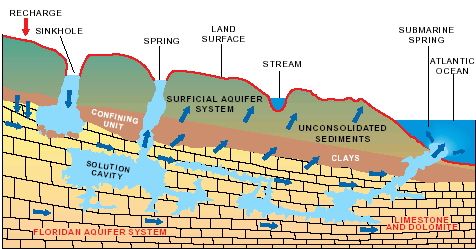 A spring is a natural opening in the Earth where water emerges from the aquifer to the soil surface. 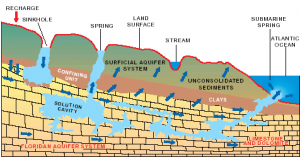 The groundwater is under pressure and flows upward to an opening referred to as a spring vent. Once on the surface, the water contributes to the flow of rivers or other waterbodies. Springs range in size from small seeps to massive pools. Each can be measured by their daily gallon output which is classified as a magnitude. First magnitude springs discharge more than 64.6 million gallons of water each day. Florida has over 30 first magnitude springs. Four of them can be found in the Panhandle – Wakulla Springs and the Gainer Springs Group of 3. Wakulla Springs is located within Edward Ball Wakulla Springs State Park. The spring vent is located beneath a limestone ledge nearly 180 feet below the land surface. Archaeological evidence suggests that humans have utilized the area for nearly 15,000 years. Native Americans referred to the area as “wakulla” meaning “river of the crying bird”. Wakulla was the home of the Limpkin, a rare wading bird with an odd call. Over 1,000 years ago, Native Americans used another first magnitude spring, the Gainer Springs group that flow into the Econfina River. “Econfina”, or “natural bridge” in the local native language, got its name from a limestone arch that crossed the creek at the mouth of the spring. General Andrew Jackson and his Army reportedly used the natural bridge on their way west exploring North America. In 1821, one of Jackson’s surveyors, William Gainer, returned to the area and established a homestead. Hence, the naming of the waters as Gainer Springs. Three major springs flow at 124.6 million gallons of water per day from Gainer Springs Group, some of which is bottled by Culligan Water today. 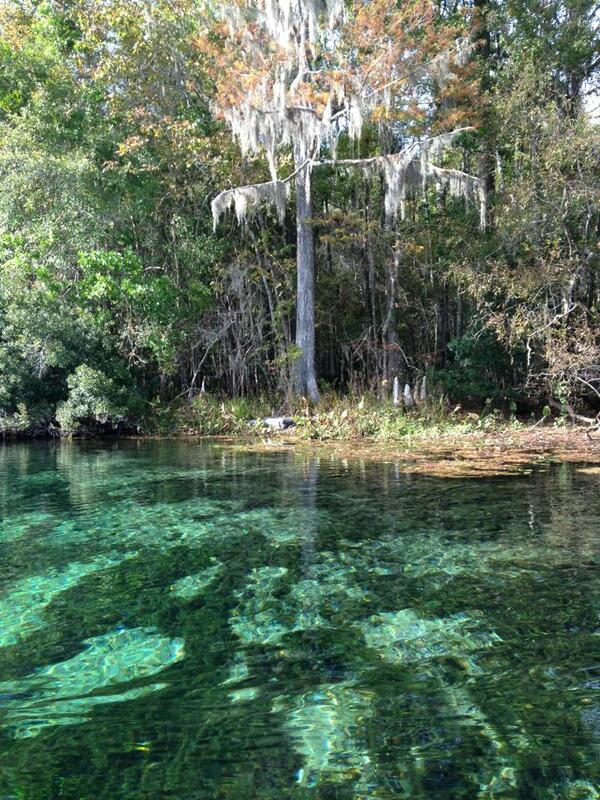 Most of the springs along the Econfina maintain a temperature of 70-71°F year-round. If you are in search of something cooler, you may want to try Ponce de Leon Springs or Morrison Springs which flows between 6.46 and 64.6 million gallons a day. They both stay around 67.8°F. Springs are very cool, clear water with such an importance to all living thing; needing appreciation and protection. St. Marks River Preserve State Park is still being developed, but open for native habitat enthusiast and those who enjoy this environment as nature established it. Located along the banks of the St. Marks River’s headwaters, this park offers an extensive system of trails for hiking, horseback riding, and off-road bicycling. The existing road network in the park takes visitors through upland pine forests, hardwood thickets and natural plant communities along the northern banks of the river. The St. Marks River is not navigable within the park boundaries. 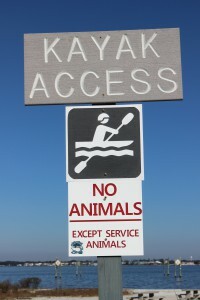 It is not conducive to canoeing or kayaking unless visitors are willing to accept long portages through thick undergrowth. Most of the trails are dry and sandy, but plan for the low water crossings which some of the trails traverse. The rainy months of summer increase the prospects of water crossings. This preserve is home to a wide variety of native fauna including black bear, deer, turkey and much more. Wildlife tracks frequently crisscross the park’s roads and trails. At the northern end of the park two sections have had timber removed. One plot has been replanted with wiregrass seed which should germinate this year. Both areas have been planted with long-leafed pine seedlings. This preserve offers avian aficionados the opportunity to witness nature at its finest as birds fill the air with their calls. A wide assortment of residential and migratory birds can be viewed in their natural habitat. There are currently no amenities available at the park and it does not have restroom facilities. Additionally, visitors must bring in water for themselves or their horse. There are no fees presently required to enjoy this gem of a park. Located east of Tallahassee, it is 3.5 miles east of W.W. Kelly Road on Tram Rd (Leon County Highway 259) almost to the Jefferson County line. 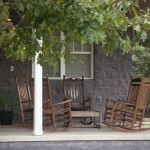 Adequate planning should be made to pack in and pack out all needed items for the day. The nearest convenience stores are located in Wacissa a few miles west of the park on Tram Road. Some of the most picturesque and scenic natural areas along north Florida’s Gulf Coast are found in Bald Point State Park. The 4,065 acre park is located on Alligator Point, where Ochlockonee Bay meets Apalachee Bay. 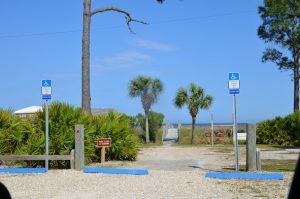 Easy access to water activities at Bald Point State Park. 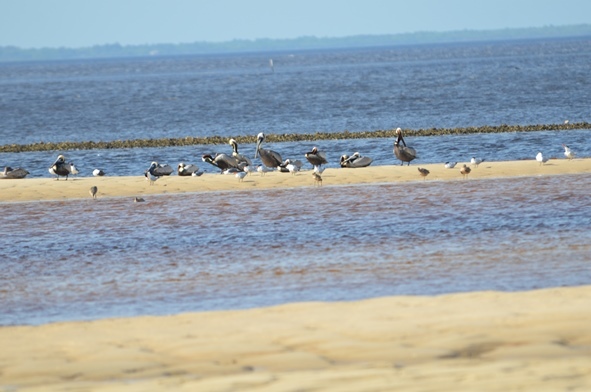 Bald Point State Park offers a variety of land and water activities. 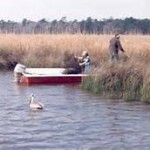 Coastal marshes, pine flatwoods, and oak thickets foster a diversity of biological communities which make the park a popular destination for birding and wildlife viewing. These include shorebirds along the beach, warblers in the maritime oak hammocks, wading birds, and birds of prey in and around the marsh areas. The boardwalk and observation deck overlook the marsh near the beach. During autumn bald eagles and other migrating raptors, along with monarch butterflies are frequently viewed heading south to a warmer winter. 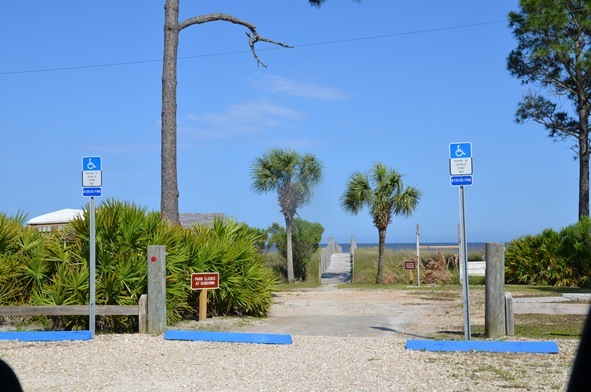 Bald Point offers access to two Apalachee Bay beaches for water sports and leisure activities, and these facilities include a fishing dock and picnic pavilions at Sunrise beach, North End beach and Maritime Hammock beach. 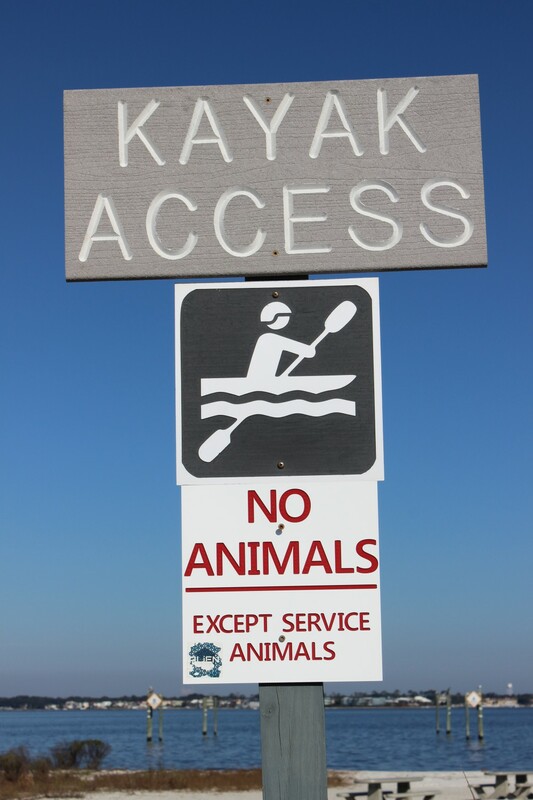 Grills and restrooms are also available, but pets are prohibited on the beach. Pre-Columbian pottery helped archaeologists identify the park’s oldest site, placing the earliest human activity 4,000 years ago. These early inhabitants hunted, fished, collected clams and oysters, and lived in relatively permanent settlements provided by the abundant resources of the coast and forests. In the mid-1800s and late 1900s, fishermen established seineyards at Bald Point. These usually primitive campsites included racks to hang, dry and repair nets. Evidence of the 19th to 20th century turpentine industry is visible on larger pine trees cut with obvious scars. 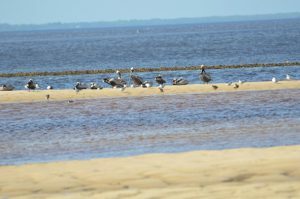 Bald Point is an excellent location for both wildlife viewing and birding. Among the varieties of saltwater fish found in the brackish tidal waterway are redfish, trout, flounder and mackerel. Today’s visitors may fish on the bridge over tidal Chaires Creek off of Range Road, and in Tucker Lake, by canoe or kayak. Sea trout, red fish, flounder and sheepshead are common catches, and this is an excellent area to cast net for mullet or to catch blue crabs. 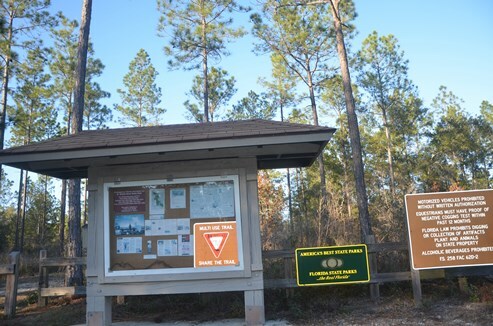 More information is available at the Florida State Park site. 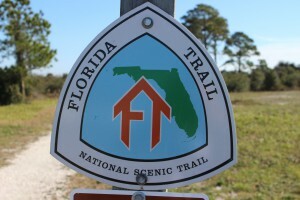 There are numerous trails where the visitor and explore Florida. We began our series on Nature Tourism along the ICW at the Alabama state line on Perdido Key and discussed the ICW itself. 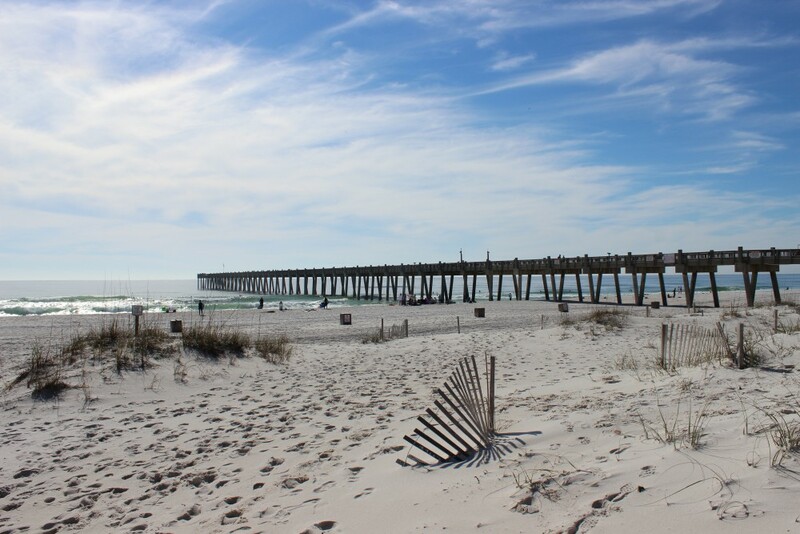 This month we will continue in Escambia County with a visit to Pensacola Beach. The dune fields of panhandle barrier islands are awesome – some reaching over 50 ft. in height. This one is near the Big Sabine hike (notice white PVC markers). 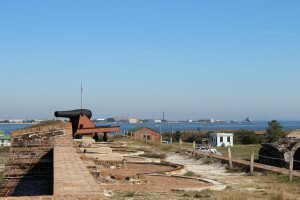 The cannons of Ft. Pickens protected the entrance into Pensacola Bay. The views of the western end of Santa Rosa Island are great from here. There is plenty of nature and history to be discovered at this park. Plan to stay the day. Pensacola Beach is on Santa Rosa Island. The longest barrier island in the panhandle, Santa Rosa Island stretches 44 miles from Ft. Pickens, at Pensacola Pass, to Destin Pass in Okaloosa County. With miles of some of the whitest beaches in the world, these panhandle islands have a variety of ecosystems. The mineral that makes the beach so white is quartz, one of the minerals found in granite rock. Over eons weathering and erosion has released these minerals from the granite in the Appalachians and sent it downstream to the Gulf coast. The densities of the different minerals force it to settle out at different rates. Quartz, being one of the less dense minerals, reaches the Gulf of Mexico where it encounters longshore currents. In the panhandle these currents more often run east to west moving the quartz in that direction. This sand forms bars and shallows which made colonial navigation a problem and good hiding places for pirates. Some of the bars remain above sea level and form dune fields and plant communities, forming barrier islands. Many animals, such as shorebirds and sea turtles, seek these islands for nesting because of few predators. The xeric conditions favor reptiles and birds, but there are many mammals and insects as well. Freshwater ponds form on many of the islands and here amphibians and fish came claim territory. The high energy beach of the Gulf side supports a community of subterranean organisms which include the mole crab (sand flea) and coquina. 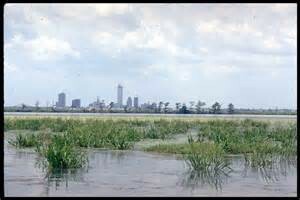 The low energy bay side harbors salt marshes along the shoreline and seagrass meadows below the surface. These habitats support a rich variety of marine life, some of the most productive in the world. The Florida Trail extends (in sections) over 1,300 miles from Ft. Pickens to the Florida Everglades. It begins at this point. 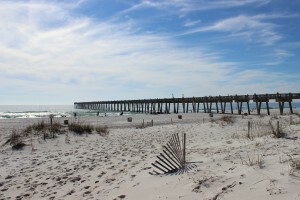 There are many places on Pensacola Beach where visitors can enjoy these natural places. 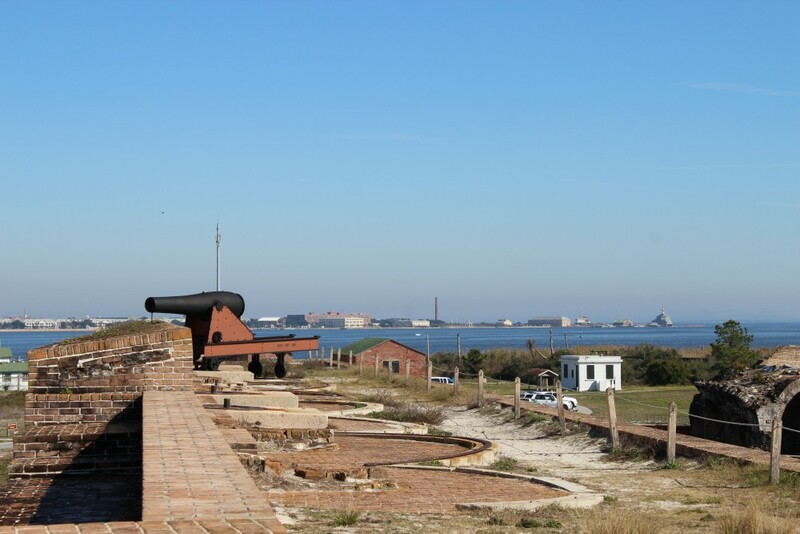 At the west end of the island is Ft. Pickens, part of the Gulf Islands National Seashore. Within the park you will find beaches to comb, piers to view wildlife and fish, jetties to fish or dive, fortifications to view the island, and a nice museum to educate you on both the natural and cultural history of the area. Here the Florida Trail begins. This trail is segmented and stretches from Ft. Pickens to the Everglades, but here it stops at Battery Langdon; it can be hiked or biked. Along the trail there are freshwater ponds and sections of maritime forest with a variety of wildlife viewing and photography. The multiple loop campground is found on this trail. 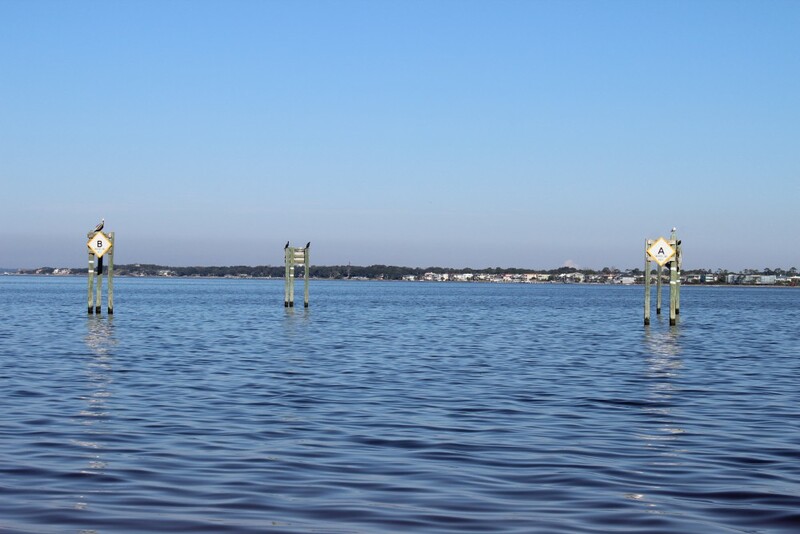 Between these pilings at Park West is one of the county snorkel reefs. Visibility is tough but the fish are there. There is a kayak launch at Park West as well. Just outside the entrance to the park is a county park named Park West. Here there is a kayak launch and nearshore snorkel reef on the bay side, with picnic area and beaches on the Gulf. 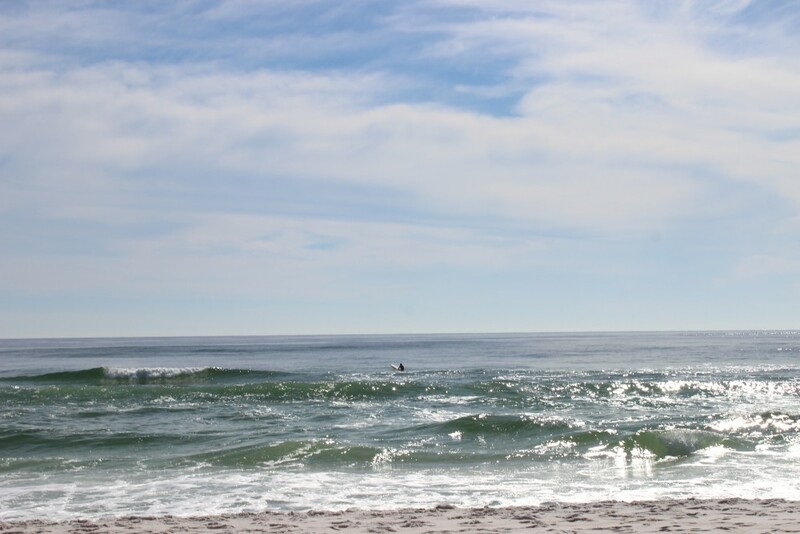 In Pensacola Beach proper there are several businesses that rent paddleboards for paddling the shallow seagrass filled Little Sabine. There are two marinas which offer sailing, fishing, and diving charters as well as dolphin tours. There are numerous artificial reefs off of Pensacola including the world’s largest – the U.S.S. Oriskany. On the Gulf side you will find the Pensacola Beach Fishing Pier where not only can you fish but, at times, see marine life. Sharks, sea turtles, dolphins, and large fish are often seen. The sunsets are great here. At the Visitors Center you can get a map to follow the Eco-Trail. This driving trail of 28 kiosks will take you to natural spots and the kiosks provide education about the area. There is a prize if you complete the trail. 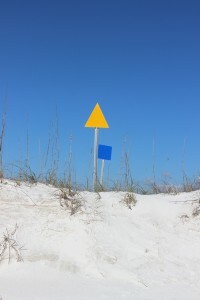 Heading east from Pensacola Beach you once again pick up a portion of the Florida Trail. At this location there is a bike path, which can be walked or biked. Park East houses a popular nearshore snorkel reef. This snorkel reef is on the Gulf side and there are beach markers to help the diver locate it. On the bay side is Big Sabine. 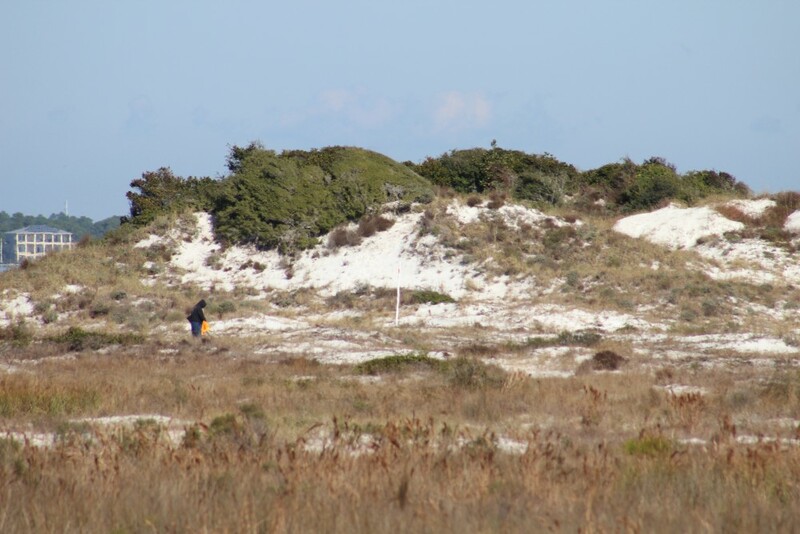 This area of high dunes and salt marsh has no formal trail but there are PVC pipes placed to help navigate your way in and out. 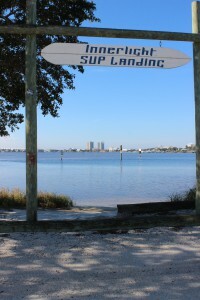 The paddleboard entry to Little Sabine can be found next to the Pensacola Beach Marina. The Pensacola Beach Fishing Pier is not only a great spot to catch fish, it’s a great spot to see marine life – and great sunsets. Further east you once again enter the Gulf Islands National Seashore. Escambia County is lucky to have almost 50% of their portion of the island within this national park. There are miles of natural beach to explore but you must use the public parking lots (no roadside parking) and watch your speed, this area supports several species of nesting shorebirds – some of which are listed as imperiled in the state of Florida. 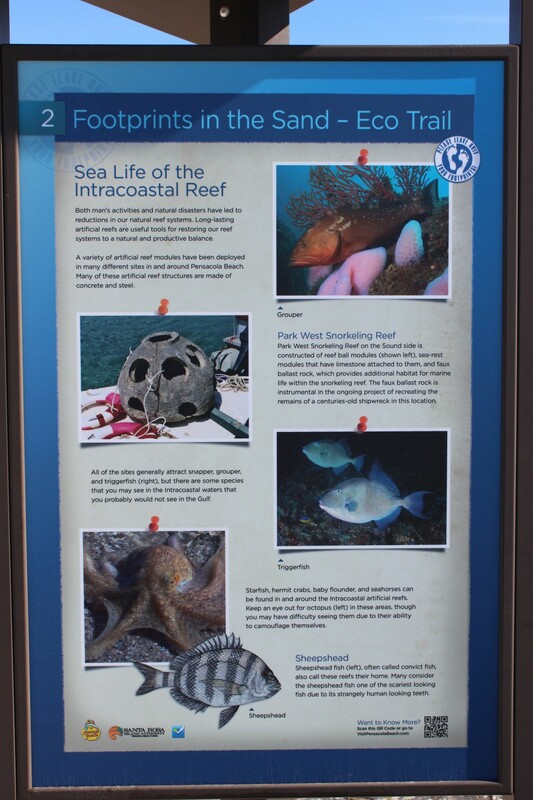 The Santa Rosa island Authority’s Eco-Trail has 28 kiosk to navigate and learn about the natural history of the island. It is a fun and educational car trip. 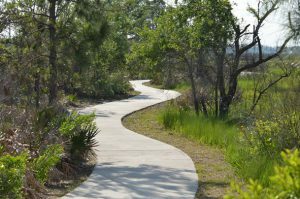 You can get the map for this trail at the visitors center on Pensacola Beach. Next month – Santa Rosa County. Aligning these markers will assist the snorkeler/diver in locating the Gulf snorkel reef at Park East. The swim is a bit further than Park West but the visibility is much better. Well… yes… during the colonial period “West Florida” extended west to the Biloxi area and besides, all western panhandlers know we are really “lower Alabama”; we hear it a million times a year… so YES, it’s part of the Florida panhandle! We’ll go with it. The shallow, muddy, and productive waters of Mobile Bay as they pass the port city of Mobile AL. 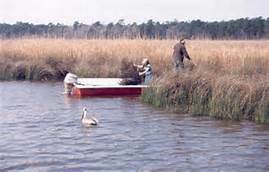 Approximately 35 miles long and 10 miles wide, Mobile Bay is one of the largest estuaries on the Gulf coast; draining close to 1/5th of the eastern United States. This wide, shallow, and muddy bay supports a variety of fresh and brackish water ecosystems. Wildlife from the Mississippi delta, the red hills of the Piedmont region, and the Florida panhandle all converge here making this one of the more biologically diverse areas in the country. It was home to both Dr. E.O. Wilson and Dr. Archie Carr who deeply loved the area and it has been a hub for estuarine research for decades. The rich abundance of wildlife supports commercial and recreational fishing and hunting as well as a growing ecotourism industry. Though the shallow bay must be dredged to support it, the Port of Mobile in one of the busiest in the Gulf region. Weeks Bay is a small tributary to this bay system. Fed by the Fish and Magnolia Rivers on the southeastern shore of Mobile Bay, Weeks Bay discharges into Bon Secour, which supports a commercial fishing business. Lined with salt marshes, cypress swamps, and bogs, this area is great for wildlife viewing and fishing. 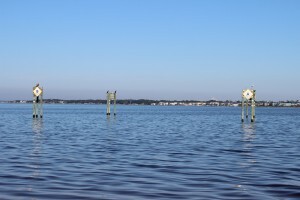 It is also the area of Mobile Bay that experiences the famous crab jubilees; where levels of low dissolved oxygen on the bottom of the bay force benthic animals – such as crabs and flounder – to shallow water seeking oxygen. About 6,000 acres of this estuarine habitat is now part of NOAA’s National Estuarine Research Reserve system. At the reserve there are interactive exhibits, trails, and pontoon boat rides to explore and appreciate this special place. 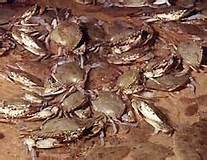 Crab jubilees occur along the eastern shore of Mobile Bay during very warm summer evenings. What better place to learn about the estuaries of the Gulf coast! The Panhandle Outdoor LIVE program will conduct one of our four 2016 watershed schools at this reserve. We will have lectures on estuarine ecology, the seafood industry in Mobile Bay – highlighting oyster farming, and on the mission of the Research Reserve itself. We will also have a local outfitter lead a kayak/canoe trip through the estuary as well an interpretive nature hike at the reserve’s visitor center. 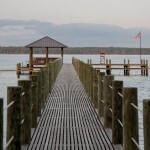 It will be set up as an overnight trip for those traveling and we will be staying at Camp Beckwith, which on Weeks Bay. Registration for this trip will open at the end of February. If you have questions about this watershed school you can contact Carrie Stevenson or Rick O’Connor at (850) 475-5230; or Chris Verlinde at (850) 623-3868. A relaxing spot at Camp Beckwith on Weeks Bay.